Poach smoked haddock in milk and cream on gentle heat for 3-5 minutes. Sweat leeks until soft. Remove fish from milk and then add the roux to the liquid and reheat until thickened. Add 100g Sussex Cheddar and mix well. Add herbs and leek and haddock. Mix 50g cheddar with breadcrumbs. 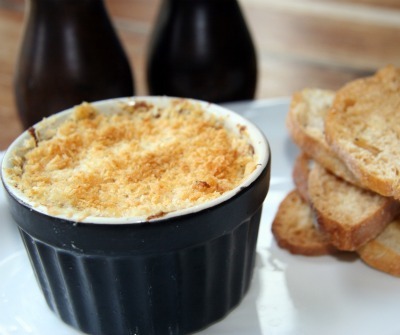 Fill four ramekins with the haddock mixture and top with breadcrumbs and Cheddar. Bake for 10-15 minutes at 180 C. Serve with warm crusty bread or croutes. You could also place a poached quail’s egg on top.